U.S. equity markets generated positive returns in December. The S&P 500 increased 1.97% for the month, while small cap stocks, as measured by the Russell 2000, increased by 2.80%. Value stocks (+2.62%) outpaced growth stocks (+1.25%). Developed international stocks increased by 3.44%, while emerging market stocks increased by a more modest 0.05% as the dollar rallied just shy of +2% for the month. For the full year, the S&P 500 increased 11.95%. The Russell 2000 (small caps) grew by 21.28% as compared to the Russell 1000 (large caps), which saw a 12.04% increase. The Russell 3000 Value Index increased by 18.38% and easily outpaced the 7.38% gain achieved by the Russell 3000 Growth Index. Developed international stocks increased 5.00% and emerging market stocks were up 11.27%. Fixed income markets were mixed in December as rates increased somewhat across the yield curve. The yield on the benchmark 10-year Treasury increased from 2.37 to 2.45% during the month. The Barclays Aggregate Bond Index increased by 0.14% for the month as Treasuries declined 0.11% and investment grade bonds increased by 0.67%. Municipals rebounded in December, increasing by 1.17%. The Barclays High Yield Index again outperformed and increased by 1.85%. For the full year, the Barclays Aggregate Index posted a 2.65% gain. Treasuries and municipals had more modest advances of 1.04% and 0.25%, respectively. As is often the case in periods when interest rates increase, high yield bonds easily outpaced these indices and increased by 17.13%. U.S. equities continued their post-election rally and furthered their advance in December. Similar to last month, small cap stocks again outpaced large cap stocks and value outperformed growth stocks. International stocks generated positive returns, with developed markets outpacing the S&P 500 and emerging markets barely in the black. For the full year, U.S. equities easily outpaced international markets. 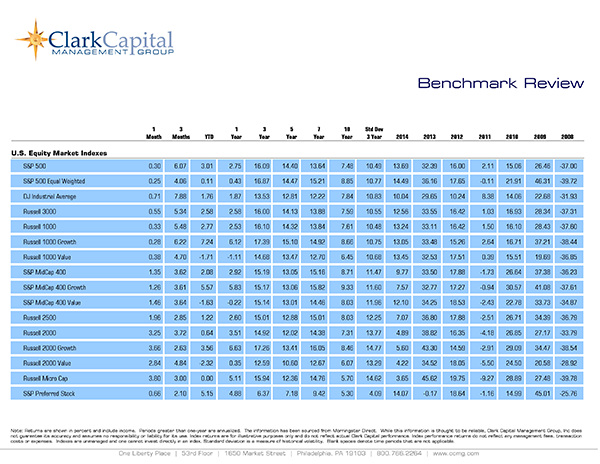 Small cap and value stocks handily outperformed large cap and growth stocks. Interest rates, in a repeat of November, again increased across the yield curve, though at a more modest pace. After hitting 2.60% in the middle of the month, the yield on the 10-year Treasury ended December with an 8 basis point increase to 2.45%. High yield bonds, yet again, outpaced more interest rate sensitive fixed income sectors. Municipal bonds recovered some of the losses experienced last month and outperformed corporates and Treasuries. For the full year, credit fared better than interest rate exposure. High yield bonds easily outpaced investment grades and Treasuries. Despite the challenges of the last few months, munis posted a modest positive return for 2016. As expected, the Federal Open Market Committee voted to increase the target range for the federal funds rate to ½ to ¾%. Economic data were mostly positive for the month. Third quarter GDP was revised up to 3.5%, the best level since the third quarter of 2014. The ISM Manufacturing and Non-Manufacturing indices signaled improving business conditions, and the University of Michigan Consumer Sentiment Index bounced to its highest level since January 2004. Existing home sales recovered to levels last seen in February 2007. Moving toward the critical holiday selling season, retail sales missed expectations and declined from the prior month.